More than twenty million people living in America are pursuing higher education as an investment in their future. Higher education has long been a symbol of mobility and possibility in this country, however, too many students are struggling financially, navigating complicated and fragile economic lives. And these financial vulnerabilities have direct and dire consequences on one’s academic pursuits — indeed roughly 70 percent of students who dropout of school do so for financial reasons. There is increasing awareness among community colleges and universities regarding the link between student financial health and academic success. But the challenge is complex. Financially vulnerable students are often managing demanding responsibilities outside the classroom, and while institutions are deeply invested in their student body’s success, efforts to support their student’s financial health are often uncoordinated and under-resourced. • While institutions are increasingly aware of the link between student success and student financial health, efforts to address financial health issues vary widely. • By measuring key student financial health metrics, institutions can begin to build a financial health profile of their students and develop solutions that promote retention and completion. • While institutions are already collecting some data, they will need to access other information in new ways to paint a true picture of student financial health. Colleges and universities across the country are steadfast in their commitment to helping students succeed, and, increasingly, that success requires an awareness of, and investment in, a student’s financial health. The Student Financial Health Metrics are designed to focus existing efforts, and spur new ideas about how schools can do that. The new CFSI report, “Driving College Success: Factors for Assessing Student Financial Health” presents each metric, along with potential data sources and considerations for schools as they begin, or continue on, their student financial health journey. Higher education has the power to change an individual’s trajectory, personally, professionally, and financially. By embedding a financial health framework within existing supports and services, colleges and universities have the power and potential to influence and improve student success, including access for those who are most vulnerable. 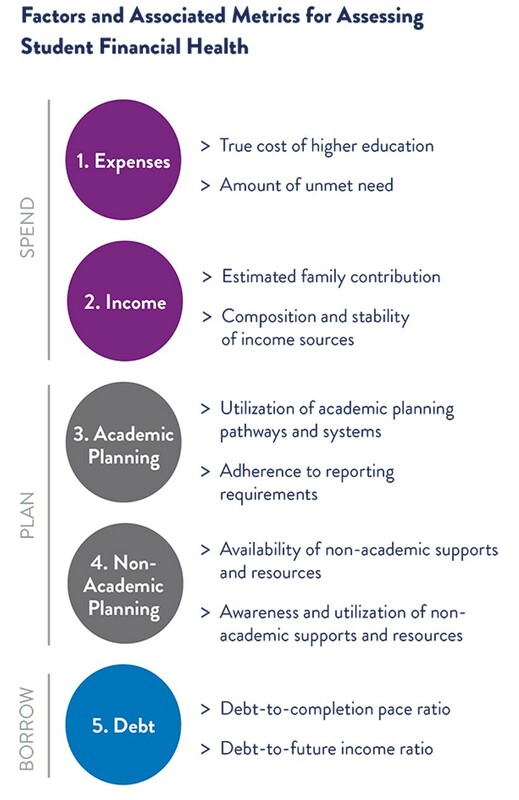 The financial health metrics can inform customized, actionable and ongoing interventions from institutions to help students remain engaged and active in their own financial health journeys. If you are interested in learning more about the Student Financial Health Cohort and metrics, or our ongoing work around student financial health, please contact tladha@cfsinnovation.org.